When book covers began to be more popularly used in the late 18th and early 19th centuries, they served mainly functional rather than artistic purposes. Aside from protecting the inner pages, covers such as leather imprints functioned as status symbols. Book production has gone a long way, with books becoming objects of mass consumption and covers playing a major role in the selling of books. 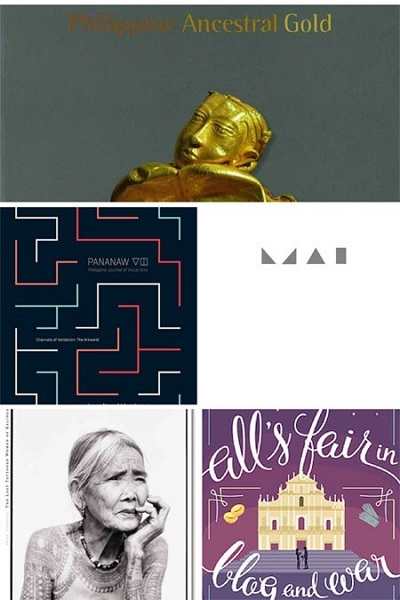 What works, or whose, inspire contemporary Pinoy book designers? Aside from Ige, Karl, Bolix, and Datu, we’ve asked graphic artists R Jordan Santos and Clarissa Ines on their favorite book covers. What book covers do you like? Bolix: I’m currently liking the covers of the new Radical Thinkers series from Verso books, designed by Rumors Studio. A recent like is also Neil Donnelly’s cover design of Henri Lefebvre’s Critique of Everyday Life. Karl: The new Italo Calvino covers by Peter Mendelsund and Oliver Munday. The sparse covers are elegant and dynamic, demonstrating the power of suggestion with the simplest of forms. Datu: Works by, among others, Ige Ramos, Chip Kidd, and Jason Santa Maria, an American web and print designer. I love what he did for the abookapart.com series. The books in this series are technical, textbooks essentially, but he was able to make an effective system through harmonious use of colors and typography. Jordan: Karl Castro’s special edition reprint of Ricky Lee’s Si Tatang at mga Himala ng Ating Panahon and Chip Kidd’s hardbound edition of Haruki Murakami’s The Wind-Up Bird Chronicle, done in collaboration with illustrator Chris Ware and photographer Geoff Spear. The two are things of beauty both in design and production. Clarissa: I’ve got so many favorites, but here are some: the signature edition of JK Rowling’s Harry Potter series; Everything is Illuminated by Jonathan Safran Foer; the Penguin Drop Caps covers, as well as the Penguin edition of James Joyce’s Dubliners; Ernest Cline’s Ready Player One; Mysterious Benedict Society by Trenton Lee Stewart; Elegantissima: The Design and Typography of Louise Fili; and the minimalist blue and red cover of Joseph Heller’s Catch-22. Ige: One of my favorites is the Shakespeare series designed by Milton Glaser. I also like the functional designs of Paul Rand, the Bauhaus movement, the Japanese and Scandinavian designers. Lately, I’m partial to the works of young Latin American graphic and typeface designers. For some reason, Latin-American designed typefaces lend themselves well with my Filipino-themed design projects. For the local designers I admire the works of Nik Ricio, especially the design he did for Gilda Cordero Fernando’s The History of the Burgis. I also like the monumental, larger-than-life, book designs of Dopy Doplon and the young Filipino designers like Bolix and Adam David. Which book cover among your works is your favorite? Bolix: Mal by Mesandel Virtusio Arguelles. Datu: The one I’m most proud of is the latest I did, the cover for Pananaw Journal for Visual Arts 8 [which suggests the mapping of one’s position as an artist in the art world]. I guess being an artist myself, I kind of understand the state of visual arts in the Philippines, the difficulty in navigating all the channels of validation. It’s like working through a labyrinth: you can get lost! Ige: Among my favorites is Felice Sta. Maria’s The Governor-General’s Kitchen, because that particular book cover challenged me to do complex illustration that combines analog and digital processes. There was so much hand-drawing involved that it hurt my hands and fingers. I used four different software to achieve what I wanted. I also like Philippine Ancestral Gold, which I designed for Ayala Foundation. This book, so far, is the most minimalist in terms of design. I like the fonts, color combination, and that particular shade of gray I used in the cover, which took me a while to find by mixing CMYK coordinates. Karl: It’s hard to pick a favorite since it’s always different each time. From my recent work, though, I’m really liking the cover for The Light of Liberty, Jim Richardson’s compendium of Katipunan documents published by Ateneo Press. I like how I was able to represent the material without employing the usual “history” motifs. I also love how Jake Verzosa’s The Last Tattooed Women of Kalinga turned out –beautiful monotone portraits by Jake, printed in subtle duotone in Singapore, and available at Silverlens. I saw to it that the design remained understated and let the portraits take center stage, while retaining character and a sense of texture. Clarissa: I’ve only done a few, but my favorite is the one for Chris Peria’s All’s Fair in Blog and War. Jordan: An unused cover in collaboration with Manix Abrera. It had humor, wit, and great illustrations. Sadly, I jumped the gun there and was more excited about it than the author so it wasn’t used. No hard feelings! Unused studies are your next masterpieces waiting to get published. What book would you love to make a cover for? Jordan: A back-to-back edition of The Bible and The Koran that points out the similarities as well as variations in their content. Karl: I would love to work on anything related to history and culture, with a publisher that would give me free rein. I would also love to do a book series. For a title in particular, I think it would be a challenge to reimagine something as historical and popular as the Noli and Fili. Clarissa: I would love to take a stab at any classic. Or, because I’m a big LOTR fan … Lord of the Rings! Bolix: Maikling imbestigasyon ng isang mahabang pangungulila by Edel Garcellano, which I’m currently encoding. I’m planning to work on the design soon and have it republished, too. I think it’s a masterpiece of contemporary avant garde writing in Filipino. Datu: I would love to improve the sad state of textbook cover design. That’s the designer and parent in me talking. Ige: The cover and design for my own book on Cavite food, which is very difficult to do.